Kellisa—my 2 pound, 1 ounce micro-preemie miracle daughter was born in 1999 with hydrocephalus, cerebral palsy, epilepsy, significant developmental delays, sleep apnea, and restless leg syndrome—has always traveled well. I believe it started when she was a baby and had to travel 138 miles round trip several times a week to see the many specialists that were keeping her alive. As the years passed and she stabilized (a little), we were able to start travelling for fun. 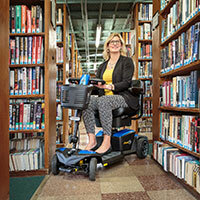 It was obvious that Kellisa loved all forms of transportation and enjoyed her time experiencing new activities. 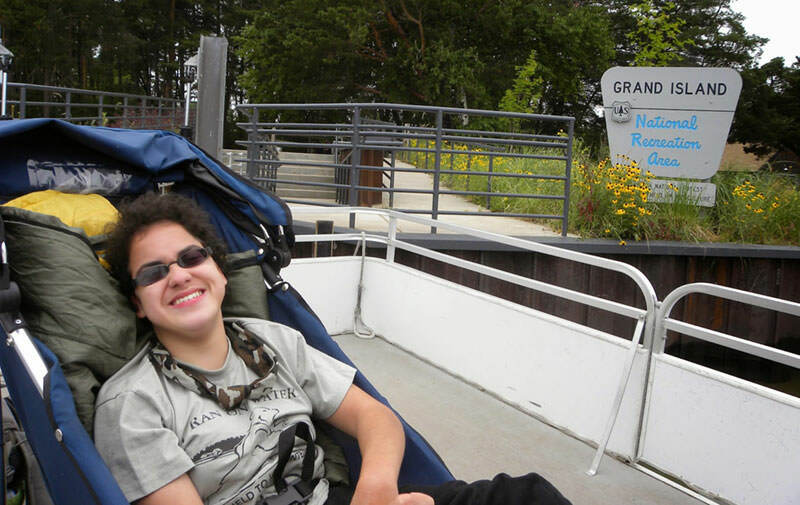 It's my theory that after spending so much time at school, appointments and trapped indoors in her wheelchair, it was refreshing for her to be outside on an adventure. We started out on short, simple accessible hikes on paved trails and boardwalks before we grew frustrated with the limitations of these trails. 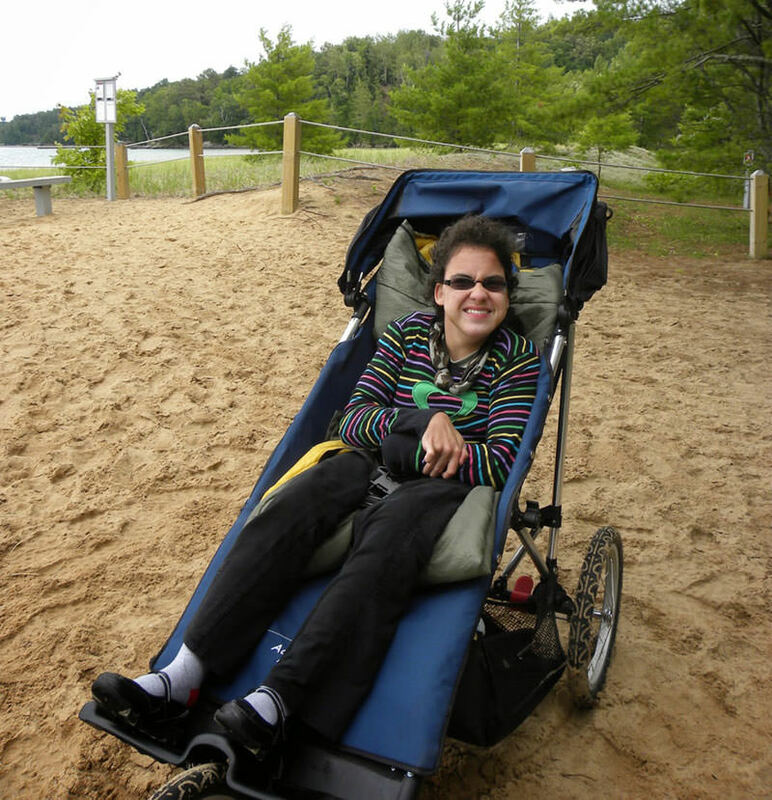 I started purchasing jog strollers and modifying them for Kellisa and more challenging terrains. Over the years, we've gone through (broken) many of these strollers before graduating to mobility chairs designed for more rugged activities. The rougher the trail, the more Kellisa loves it. I started referring to the activity of me pushing Kellisa while hiking as "pushiking." 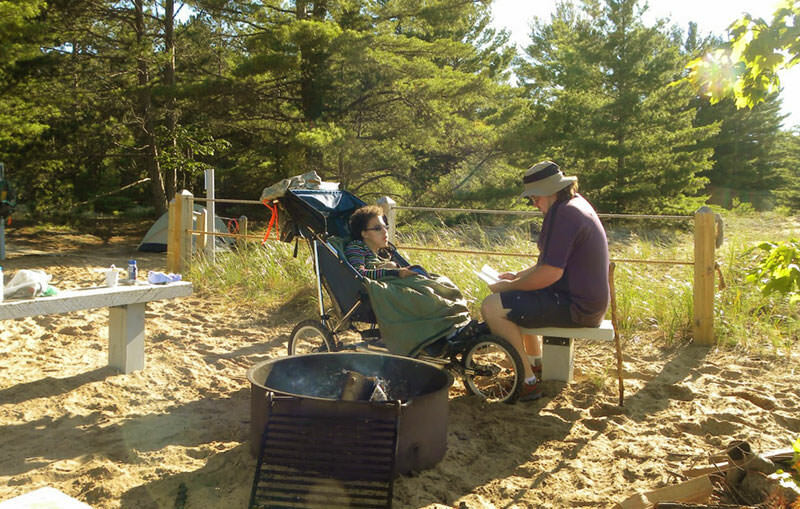 Kellisa has been pushed to many places wheelchairs weren't meant to go—20 miles across a desert in one day, mountain summits, canyon bottoms, through swamps and many other places as we travel across North America. Communication has always been a struggle for Kellisa. She is mostly non-verbal and uses basic sign language as her means of communication. She often gets frustrated because her receptive understanding is far greater than her expressive skills. I get frustrated because she can say any word she wants, but she needs motivation and that's been the main obstacle. Kellisa has no problem saying the name of every cute boy in her life, but it's nearly impossible to teach her to say something simple like "apple" if she doesn't want to say the word. Kellisa had been stuck with her speech for a few years when something amazing happened while on an adventure in the panhandles of Texas and Oklahoma during a spring break hiking trip in 2008. Kellisa started talking up a storm. She was not only motivated to try new words to describe her surroundings and experiences, but she was actually excited and proud of herself. She was shining. This pattern of learning new words while on adventures continued. We finally found something that motivated Kellisa besides cute boys. To be clear, Kellisa wasn't speaking in sentences, but was learning new individual words. Kellisa would learn more words in a long weekend trip than she would after 6 months with a speech therapist. This amazing progress would eventually allow us to cancel Kellisa's private speech therapy. 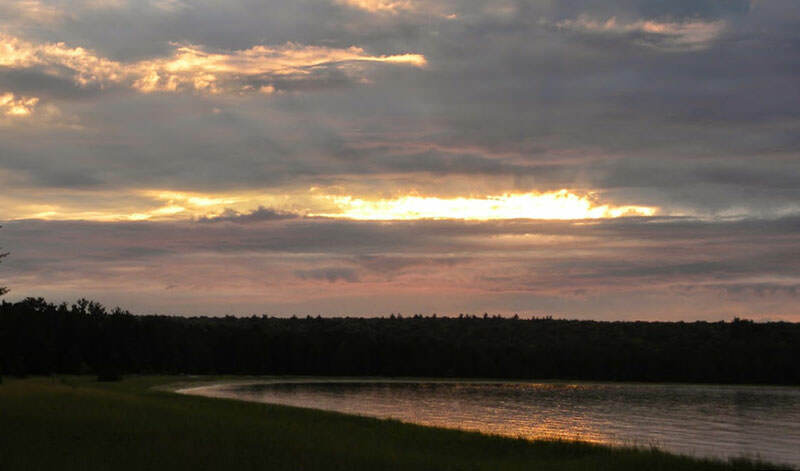 In the summer of 2013, I decided to take Kellisa to Grand Island National Recreation Area in Lake Superior. Grand Island is undeveloped and uninhabited, except for a large black bear population roaming the forest. At one point, the island was going to be developed, so a rough road circles the island. Although rugged, it is the perfect trail to pushike with Kellisa because it's wide and mostly free from wheel stopping obstacles. The island has a few scattered campsites and I planned to take Kellisa for 3 days and 2 nights. Seizures are usually my biggest fear when traveling deep into the wilderness with Kellisa. We travel with multiple seizure rescue medications, but I'm always a little on edge knowing that help is many miles and hours away. 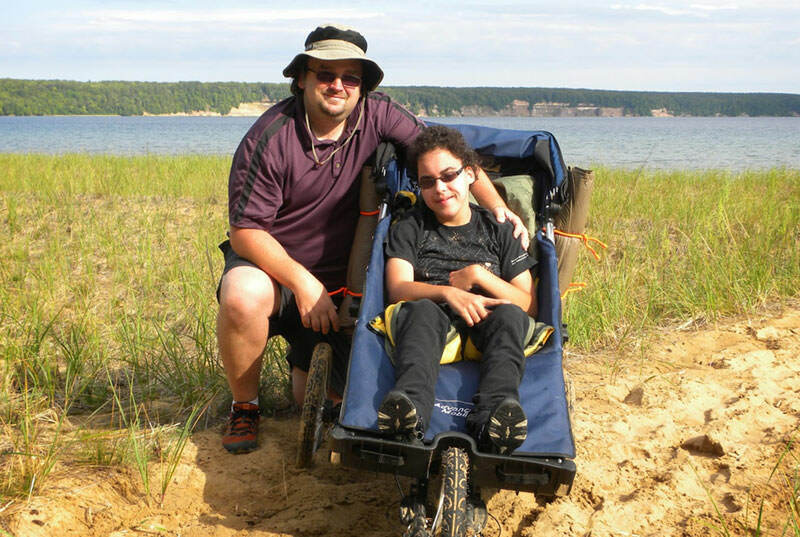 Since Kellisa enjoys and thrives on these adventures, I think the risk of punishing her for having seizures is greater than the risks we face in the outdoors. Since Grand Island has a healthy black bear population and we would be backcountry camping in their backyard, I had something else to worry about. Each campsite had a bear box to store all food and scented items. Since Kellisa drools while eating, putting a clean shirt on her at bedtime seemed like a safe plan. I wanted the only scent coming from our tent to be from two hikers who hadn't showered in a while. Our first day on the island was magical; we hiked many miles before setting up camp on a secluded beach overlooking a bay surrounded by towering cliffs rising directly from crystal clear waters. We enjoyed a macaroni and cheese dinner beside a glowing campfire. Kellisa was already mastering new words: big, lake, town, and small. I was very proud of her and was thoroughly enjoying our time together. 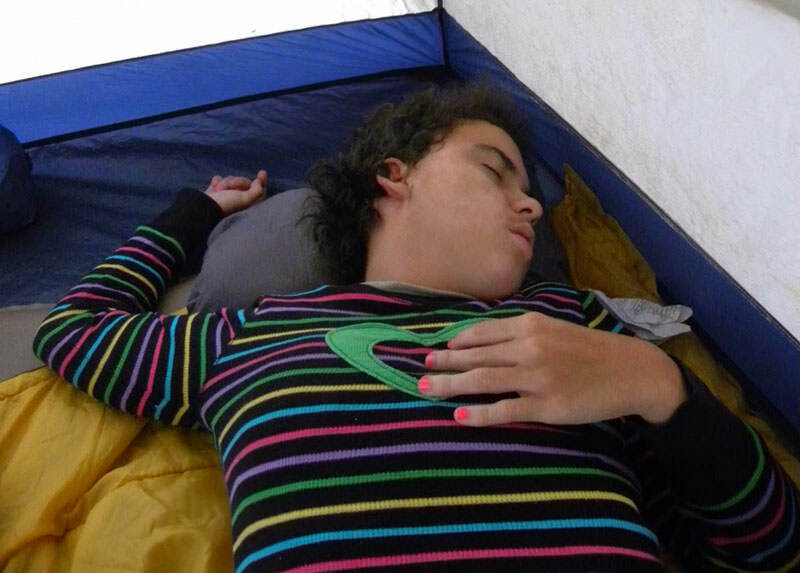 Kellisa went to sleep in the tent with the help of her evening seizure medications. I cleaned our camp and was careful to properly store everything to keep our tent as scent free as possible. Drifting off to sleep came quickly for me after a challenging day. 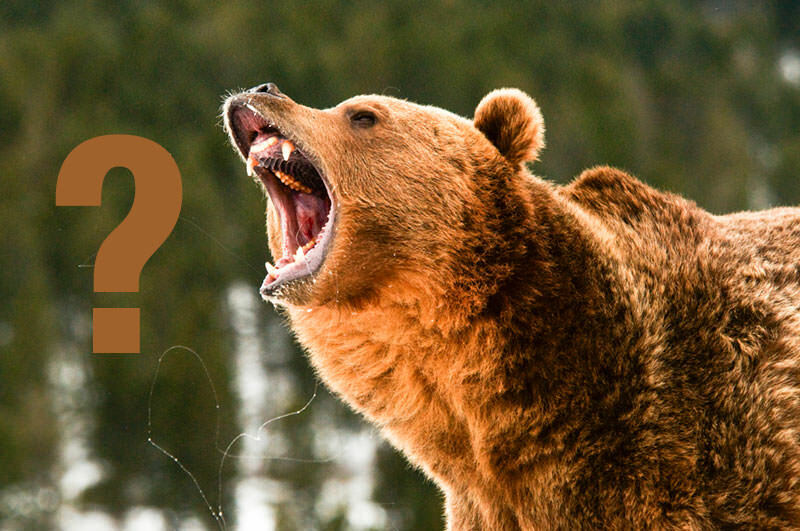 Then my worse fears came true when I was awoken from a deep sleep around 3am by a bear's grunt. It sounded like it was only inches from my head. The fact that the only thing separating us was a thin layer of tent fabric wasn't at all comforting. There was another grunt and I knew this wasn't a dream. I was paralyzed with fear. My mind was telling my body to reach for a flashlight and the knife I had by my side, but my arms didn't move when I heard another grunt proving this bear wasn't just passing by our tent. Finally, after what felt like hours, I was able to wiggle a few fingers, but my arms were still in a locked position inside my sleeping bag. I started feeling guilty for bringing Kellisa on this adventure. There was another grunt and I was thankful that Kellisa was sleeping through this encounter. With her developmental delays, she would have been excited to have a bear so close without realizing how much danger surrounded us. I was finally able to free one arm to reach a flashlight as another grunt echoed through our tent. I was able to tell that the last grunt clearly came from Kellisa's direction. I was able to prop myself up on one arm and flash the light over her sleeping body. I was praying this would scare the bear away because I was in no mood to wrestle a black bear since I still didn't have a hand on my little knife. I also told myself that I would never take Kellisa camping in bear country if we survived this night. With the tent illuminated, there was another grunt, but this time it seemed like it was Kellisa making the noise of a bruin who sits undisputed atop the food chain on Grand Island. I kept the light on while watching Kellisa's sleeping face. Sure enough, there was another grunt, but it was clear that the sound that nearly scared me to death was just Kellisa snoring. I was relieved, but my heart had been pounding so hard and fast, it was hard to settle back down and I wasn't able to fall back asleep that night. For the next few hours, I couldn't help but laugh a little every time Kellisa let out a terrifying snore. Kellisa woke up completely refreshed and ready to enjoy another day on the island. I was tired, but the beauty of the island and, more importantly, Kellisa's excitement and constant giggles were enough to get me going. We enjoyed a full day of pushiking and exploring the island. We even found a spot on top of a cliff rising from the shores of Lake Superior where I had one fading bar on my cell phone; just enough for a brief call home so Kellisa could share her new words with mom. Kellisa was enjoying her time on the island far from her everyday life. I was so proud of her as she was talking almost non-stop. Our second night was uneventful as I was better prepared for the middle of the night grunts from my tent mate. It took me less than 24 hours to break my promise of never camping in bear country again with Kellisa. We plan on returning to Grand Island in the summer of 2015 to introduce Kellisa's younger sister, Laurel, to this little piece of paradise. Chris Kain is Kellisa's adventurous and devoted father. With a blog (www.kellisaspath.com), Chris shares Kellisa's medical journey (not expected to survive more than a few hours after birth, 22 surgeries and countless brushes with death) and how she lives a life without limits (hiking, camping, kayaking, dancing, bike riding, playing little league baseball, bowling, bungee jumping and many other activities) as she continues to break the stereotypes of a girl dependent on a wheelchair.